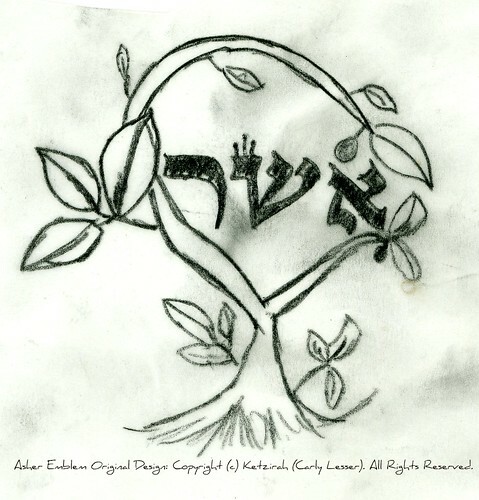 Original design I created for my nephew Asher's bris kippah. My nephew Asher was supposed to be born in Shevat, but came a few days early last year! Shevat is a month where, in a non-leap year, we should begin to see the signs of spring emerging by the end of it – or at least know it is coming so very soon – and this makes most people very happy. We celebrate the return of spring through the holiday of Tu B’Shevat, which is one of the four traditional Jewish new years. Asher seems to be associated with delicious food, too, “As for Asher, his bread shall be fat, and he shall yield royal dainties.”(Gen 49:20) What a perfect correspondence to the sense of the month, Taste, and the Kabbalistic tradition of a Tu B’Shevat seder that has become so popular in recent years. Food is one of our simplest pleasures in life! A month of simple happiness – is that possible? So many months of the year offer us challenges that seem insurmountable. What kind of a challenge is happiness? The mazal, the astrological sign of the month, gives us some clues to the challenge of happiness. The sign of the month is the D’li (דְלִי) – the Bucket (Aquarius). How do you contain happiness? How do you give fluid emotions like joy a shape? You need a container – not to close it in, but allow you to carry it forward and share it. Another lesson of Asher is the line between right and wrong. Can something be wrong if it makes us happy? There is the question between a moment of happiness and true life-long happiness. The name Asher is clearly related to the word Ashera. Wait…how can a beloved son of Jacob have anything to do with a forbidden ancient goddess that the Torah repeatedly warns us of?!? Maybe the issue here is the vessel of choice – not what was contained in it. 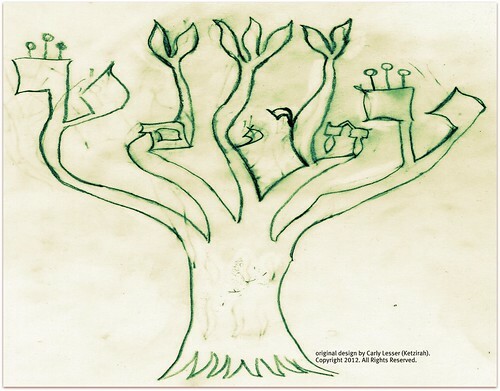 She is a tree of life (עץ חיים הי), but we do not need the image of tree to worship. I can think of a lot of things that make me happy for a moment, but do not sustain ongoing happiness for myself or anyone else. Asher is also seems like it must related to the word “asher” – meaning “that” or “which.” Could it be that something which enables something else is the key to true happiness? Does sustainable happiness need to be able to connect two things together? Happiness is simple and it is complex – just like Jewish life. The lesson of Asher for Shevat is to explore true happiness. What form does it need and what forms will it take on? What is the difference between a moment of happiness and a life of true joy? The lesson of Asher is to find happiness olive tree that can sustain generations, not just the olive that feeds you alone for a moment. That’s what I find. What about you? Want more Insights into Shevat?